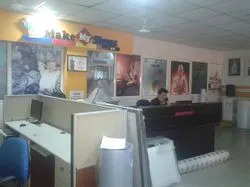 Established in 2011, "Gogia Print-O-Grafix", has emerged as the undisputed leader in the industry for service provider of reliable range of Custom Made wallpapers and Printing Services. As renowned leaders, we are offering Custom Made wallpapers, Wallpapers Printing Services and Custom Prints. Our highly experienced designers manufacture optimum quality products for a range of billboards, advertising hoardings and public sector wallpapers across the nation. Our products, appreciated for their fine art, elegant look, durability, low maintenance and weather resistance, are catering to demands of both Private and Public sectors. We hold an enviable position in the market only due to the hard work and supervision of our mentor, "Mr. Amit Gogia". His profound knowledge and conformity in our realm, besides his contagious sincerity motivates us to meet annual fiscal goals in the most effectual way. People are the most important part of our organisation. Our Clients are the focus of everything we do. We have many known clients which are satisfied with our products and services. By virtue of our qualified professionals and dynamic approach to the matching market scenario, we have achieved dashing success. Having started in 2007, we have already emerged as one of India’s leading manufacturers and service providers of Printing Services. Excellence is a blend of quality, innovation and technology. We are engaged in the enhancement of all these factors. We ensure that highest quality standards are maintained. Our quality control management system ensures that our clients are delivered quality products within stipulated timeframes. Our team of experts maintain a strict vigil on the manufacturing process for ensuring flawless products. Right from raw material procurement through the various production and testing lines, down to dispatch, every section makes conscious and concentrated efforts to weave in that extra unifying core of quality in the product. Our production processes are carried out in a vast facility located in New Delhi. This world class facility is equipped with advanced machinery and equipment. This unit is operated by a dedicated team of technicians, engineers and R & D personnel who are experts in manufacturing something new and different. Their efficiency in handling customers’ needs help us to effectively meet their customised requirements. We are widely known for delivering our products in customised patterns as per the specification given by the clients.